2015 Wandsworth Honey just harvested! 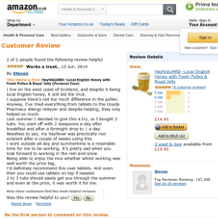 Great HayfeGUARD Local Honey testimonial someone wrote on Amazon! Surburban gardens can keep bees without posing a risk to neighbours? 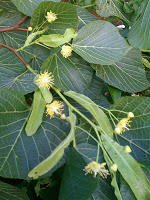 British Lime Trees, nectar producing now! LIMITED OFFER- Honey & Wax Cappings- HALF PRICE! Free Honey Taster table- try before you buy! Our Beeswax Lip Balms are the Best! Wishing you a Very Merry Christmas. Ho Ho Ho! Found- lost crates of honeypots. Not seen the light of day for over 20 years. Our Xmas Street Fair this Saturday 28th November!! At Holland & Holland, Mayfair honey tasting and talk. The largest most extensive honey show in the UK is here! Twitter Prize Draw Winner picks up her hamper! The Hive Honey Shop- Honey Winner at yesterdays London Honey Show! Meet James, Our Head Beekeeper, Guest Speaker at The London Honey Show, this Sunday! Looks Like Apple Juice This Year! 20,000 Live Bees On View -Back at The Hive Honey Shop! Annual Holiday Closure from Dec 25th- Jan 3rd. Our Orchard Apples Are Back! Harvesting August Pollen -Amazing Colours! HONEY FOR HAYFEVER- We are on ITV Tonight!! Pancake Day Today- Top with warm honey!! Cold & Flu Season! Don't forget to stock up on our health aids…. MERRY CHRISTMAS FROM OUR BEES! Twas the week before Christmas…..
Honey Truffles & Honey Sea Salt Caramels have arrived! Our very own head beekeeper has just been crowned… London Beekeeper of the Year! 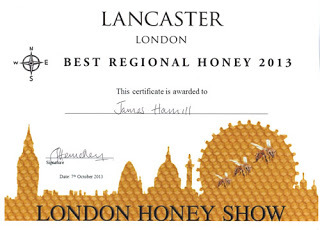 It's now Official- We have the BEST LONDON HONEY! 1700s Rare Old English Apples are back! EASTER- SUNDAY MARCH 31st- Honey No Eggs! G Baldwins & Co Purveyors Of Natural Products LOVE our HayfeGUARD Local Honey! Honeycomb of all sizes for sales!! Imagine Looking Up And Seeing 50,000 bees!! Beekeeping Course was a Great Weekend!! Honeybees for Sale / Nuclei for Sale-HURRY 7 left!! Sign up for June Beekeeping Course- Hurry Limited places!! Government Bee Inspector Passes our Bees with-Flying Colours! See us on BBC Great British Food Revival Tonight 8pm! I was wondering whether Hayfeguard being unpasteurized is safe to take in pregnancy? Meet us at the the Natural & Organic Food Show, Olympia, London April 3-4. Wishing you a Very Merry Christmas & Joyous New Year! Northcote Road Christmas Lights Event! A true love of honeybees! What a great year for insects! Bees caught in a sticky situation-The Hive Honey Shop featured in the Telegraph today. Battersea Children's Zoo- Honey Bee Day- A Success! What happens to honeybees in the winter? Bernie the Bee-Mascot for The Hive Honey Shop Arrives! Come & Meet us LIVE at Waterstone's Clapham!